(BENSON) Small steps can make a big difference. 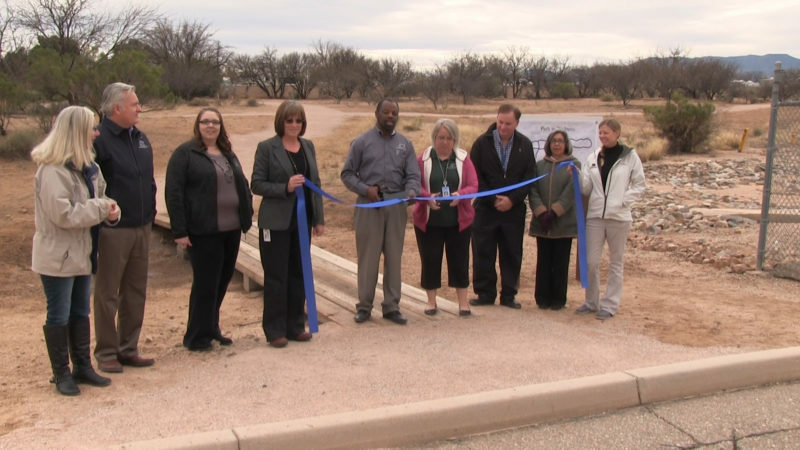 A new way to start taking some of those steps is the walking path on the south side of the AzGT Benson campus that became available to employees when the project officially opened with a ribbon-cutting ceremony Thursday, Jan. 19th. (left to right, “w” indicates Wellness Committee member) Graphic Services Specialist Carol Kuipers(w), CEO Patrick Ledger, Human Resources Specialist Shannon Garner(w), Facility Services Coordinator Cheri Shull(w), Facility Services Manager Hewitt Stewart, Human Resources Generalist Lanel Gamez(w), Director of Administrative Services Emery Silvester, Financial Services Associate Blanche Gonzalez-McCune(w), and Safety Specialist Nancy Railsback(w) cut the ribbon to the new walking path at the Benson campus. 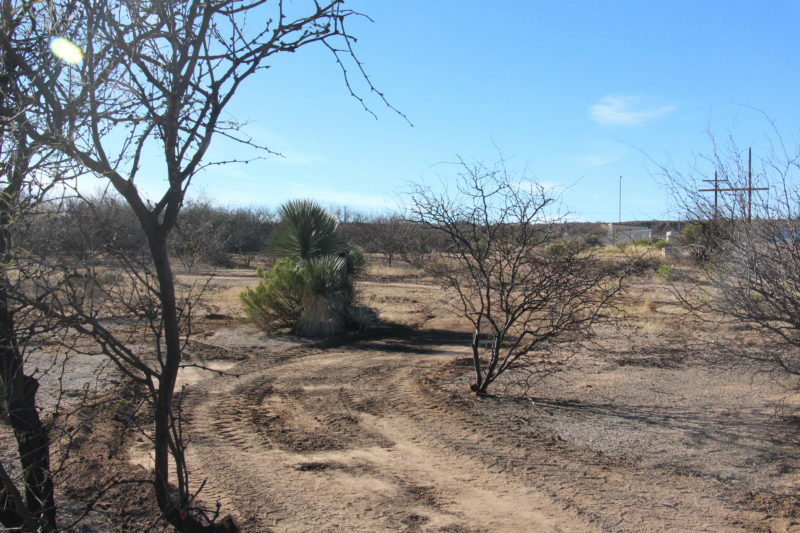 Planning for the path began in November and construction began the third week of December. Hewitt Stuart, facilities services manager, said most of the construction was completed the Monday before the ribbon-cutting. “We’ve done a lot of work to make this not only a safe and useable walking path, but to make the rest of the property safe and attractive as well,” Stuart said. Landscaping crews trimmed trees and cleared underbrush, and removed wooden beams and other material that was stored on the property. Workers clear brush from the path area. 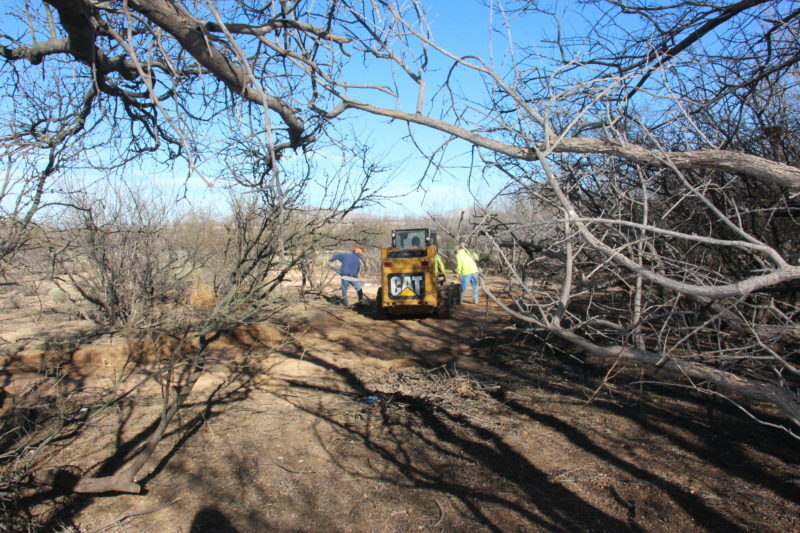 An image taken on January 4th shows the 12-foot wide area that was cleared for the path during construction. The same area that is pictured above is seen here after construction is completed a week later on January 10th. 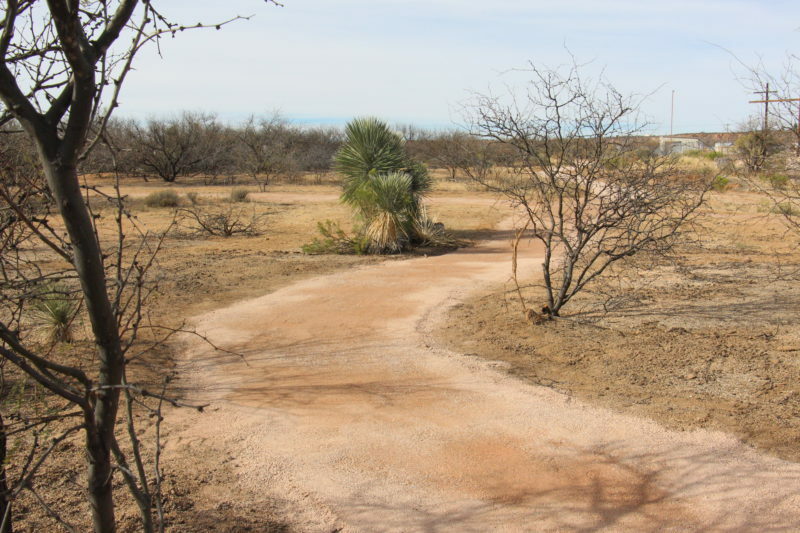 “The actual path consists of stabilized, decomposed granite. We cleared a total of 12 feet of vegetation along the pathway and tried to leave everything else in its natural state,” Stuart said. A complete circuit is half a mile, twice around would be one mile. The walking path sits on a total of 5.55 acres that was part of the original purchase of the property on which the Benson campus is built. The one entrance to the path is a bridge made of treated wood beams, located adjacent to the fence on the south side of the south gate. 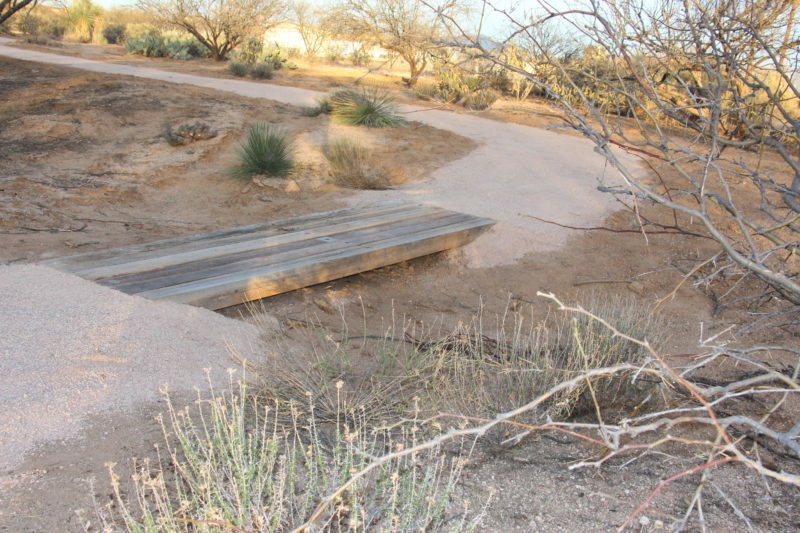 There are several small bridges across minor washes along the trail, also made of reclaimed wooden beams. 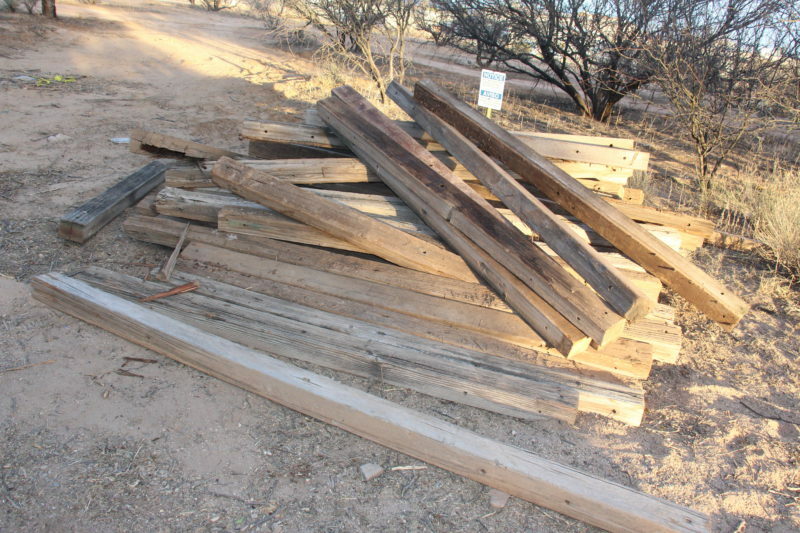 Some of the lumber that was stored on the site and cleared from the pathway sits in a pile. Stuart said the area is “a work in progress” and employees can look for continued improvements to the path and property. “We’re going to have signs identifying the local vegetation, with the scientific name and the common name specific to certain plants,” Stuart said. “We’ll also have a path map at the entrance, and distance markers along the path as well as an additional map at the halfway mark,” Stuart said. Lanel Gamez, a member of the Wellness Committee, said the pathway provides another way for employees to improve their health. “We’re really excited. It’s a beautiful area, a beautiful and very user-friendly pathway, and we’re going to put up motivation signs on the path to reinforce the health benefits of walking,” Gamez said. “I would like to thank our facilities services team, the staff in the land services and environmental departments, and those on the wellness committee for their support,” said Stuart. Employees are welcome and encourage to use the walking path at any time, said Stuart.